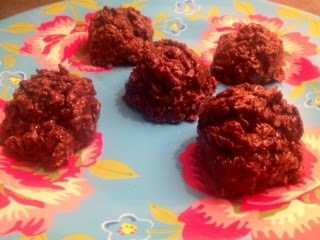 Sets and Recipes: No Bake Almond Butter & Chocolate "Cookies"
The picture above does not do these cookies any justice! Sure they do not look that appetizing, but trust me, they are!! I needed to make something quick for a last minute beach day, so i started going through my cupboards to see what I had. With a few basic ingredients this recipe came together quite nicely! I added some maca powder and flaxseed for added vitamins, minerals, fiber and omegas! melted together. Stir in the almond butter until melted. 2. Remove from heat and stir in vanilla, maca, flaxseed, and oats. or until hardened. The recipe should make 20 cookies.